10 succulent cuttings all uniquely different from our gardens in sunny California. The plant cuttings from Shop Succulents are cut fresh per order. We guarantee only the highest quality succulent plant cuttings. Your order will include 10 beautiful succulent cuttings. A variety of this size allows you to instantly create combinations based on color, size and shape since each cutting will be different. A perfect addition to any succulent design! 10 succulent cuttings from our gardens in sunny California. We have over 50 varieties and no 10 pack has 2 of the same kind. Each cutting was picked individually and packaged with love. Great for terrariums and easy to care for. Your cuttings will be ready for use upon arrival. Finding 10 uniquely different healthy varieties of succulents at one time can be a challenge. 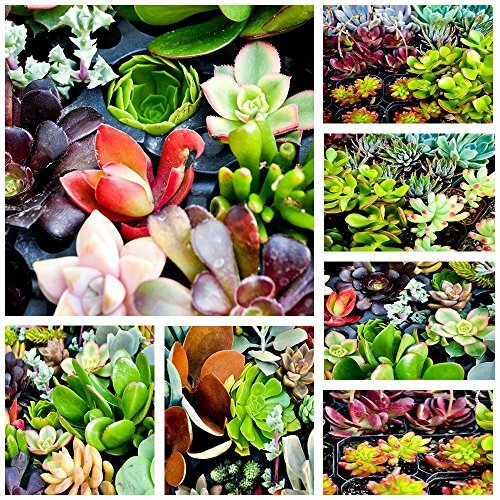 With this collection you will instantly have an interesting and varied succulent garden. The variety and also enhance your existing succulent garden. All plants you receive will be cuttings (not rooted) and ready to be planted in potting soil.